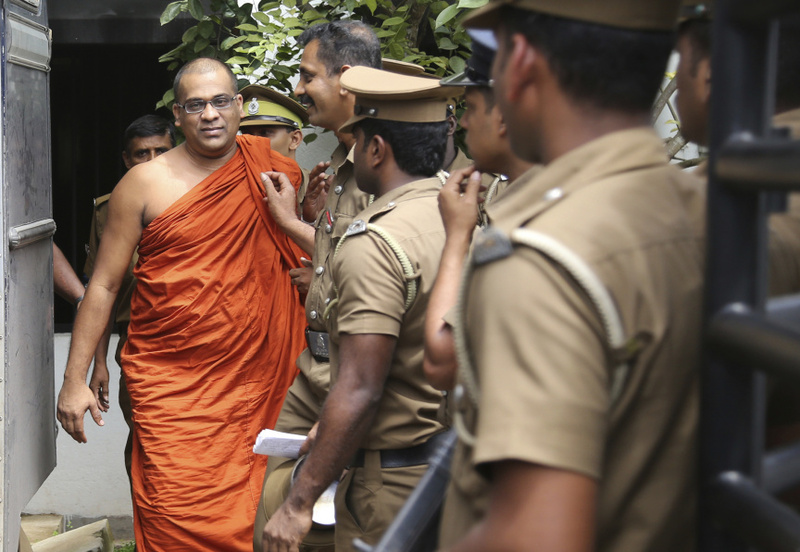 COLOMBO, Sri Lanka (AP) — A Sri Lankan court on Thursday sentenced a hard-line Buddhist monk to six months imprisonment for threatening the wife of a missing journalist. Galagoda Atte Gnanasara was convicted on two counts of harassing and intimidating the wife of missing journalist Prageeth Eknaligoda. Magistrate Udesh Ranathunga of the Homagama Magistrate Courts on the outskirts of the capital Colombo also ordered the monk to pay a fine compensation. After the sentence was announced, saffron-robed Gnanasara was put into a prison vehicle and then taken to the prison. He was charged for statements he made at a 2016 during a court hearing into the disappearance of Eknaligoda, who is believed to have been abducted by government forces in 2010. The monk, who had attended the hearing to show support for the soldiers arrested in the case, was found to have used abusive language. Sandya Eknaligoda has been campaigning for her cartoonist husband and others who went missing during the island nation's ethnic conflict. Last year, she was awarded the United States International Women of Courage Award presented by the U.S. State Department. She received her award from first lady Melania Trump. Scores of Sri Lankan journalists went missing during the war, with most of them allegedly abducted by paramilitary groups. Gnanasara is the leader of a Buddhist group blamed for instigating attacks on Muslims. The group has denied the allegations. Gnanasara was already facing legal action over several hate attacks against Muslims.